In 2003, my wife, Bethany, and I were given the gift of a trip to Alsace, France, to visit my accordion teacher, Sylvain Piron, his wife, storyteller Catherine Piron-Paira, and their family. I wrote the following shortly after the trip. It appeared some time later in Wolf Moon Journal, a local Maine literary magazine. I present it here in installments over the next few months. Coming into Saverne, France, by train, Bethany and I spot Sylvain and Catherine standing on the platform. Catherine’s already seen us and rushes over. Sylvain walks over, relaxed. And after fourteen hours of travel, that’s all the French my wife and I can muster. They kiss us on our cheeks, which is disconcerting for us. We hug them, which is disconcerting for them. We drive fifteen minutes to their village, Steinbourg, in a boxy Peugeot. The village is very compact, with its church, red roofs, twisty roads, and boulangeries. “Hey!” I say to Bethany, “We’re in France!” It seems too wonderful. Alsace! In the front seat of the car are two of our dearest friends. I’m far too exhausted to express the joy I feel. Their house is in a lane of sandstone homes on the Rue du Maréchal Leclerc. One might easily miss the plain wooden door were it not for the ceramic plaque above, showing the number XXVI along with a stylized accordion. Up the steep staircase, we find small rooms, but lots of them. The interior walls are a sort of pink that doesn’t occur in nature but does occur pretty frequently in French homes. The center of the house is the dining room, with a dark wooden table and any number of armless, wooden chairs — a requirement at musicians’ gatherings. This is a room as much for music as for meals. On the floor, sitting open in their cases are two Castagnari accordions, and a third, an older Salterelle. Their nameplates tell me they are world-class instruments built by two of the most highly esteemed shops in the world. I’ve not brought my accordions because there is no need. Coals to Newcastle and all that. My own coal — a factory-made Hohner Corso–is markedly inferior. * A good box, but only good. 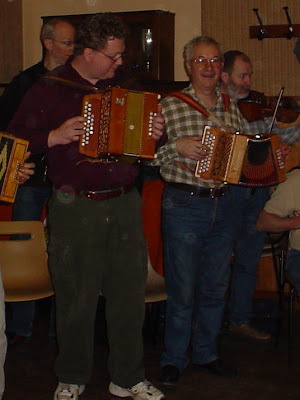 Sylvain (right) playing the Benny. Over the past months, Sylvain has described the two newer instruments, which came into his life about a year prior. The first Castagnari is a “Benny” (that’s the model name), a compact three row beauty. Two rows are in the usual French keys (G and C, or do and sol) with a third row tuned to various sharps and flats. The second Castagnari is a “Tommy,” a two-row, also compact, that, because of its size and the sensitivity of its touch, is especially well loved. The Salterelle is the instrument Sylvain has played for years, a “Pastourelle III.” It’s the instrument on his first CD, Tranche de Temps (link to free download). It’s also in the usual French keys, do and sol, with a half row of five buttons giving sharps and flats. I am especially possessed by it because Sylvain had asked me, given that he had the Castagnaris, would I like to have the Salterelle on a long-term loan basis? I pick up the Salterelle. This is the best instrument I’ve ever laid my hands on. Certainly it feels better than anything I’ve ever played. I start a waltz, “Sur la bord de la riviera.” Sylvain takes up the Benny. My exhaustion, which had been deepened by a lasciviously rich meal and three glasses of bordeaux, disappears. *My opinion of the Corso has changed considerably since then. Though I still feel the hand-made boxes are superior in every way, I don’t, if you will, feel that the Hohner is in any way inferior. In short, I feel an extraordinary affection for that accordion. Previous Post The Last Accordion I’ll Ever Buy?